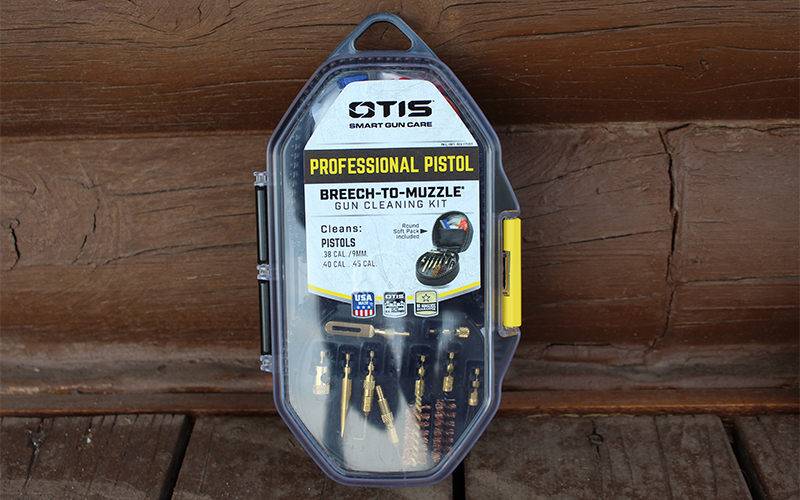 Recently, I tried the Otis Professional Pistol Cleaning Kit, including their cable cleaning system, and found that their cable system is NOT the old cord “pull though” system I had used (once) in the past. I like it! So, I decided to delve deeper into the Otis line. I shoot and clean my pistols a lot more than any other firearm, so I’d like to take a closer look at Otis Systems for handguns. Otis makes one pull cleaners –Ripcords (without a cord). They start with a cable, contained in a rubber core – which is intentionally made lumpy with rubber bumps. The lumps insure all around contact of the nomex cover. The cover traps and removes built up fouling. The cable is designed with a threaded tip, so you can add a brush or patch damp with Otis CLP (more about this below) if you so desire. This would be ideal if you are ’n the field and can’t see clearly through your bore. Even insects can nest in a rifle or pistol bore overnight. Fire a shot with the bore obstructed, and you will be very lucky if you are not injured. Truly your gun could blow up! One pull with the Ripcord and you can be spared an early end to your day shooting. These caliber specific tools can also help if you are changing bullet types – going from moly coated to jacketed while testing loads at the range, for example. They are just too handy to leave behind. Roll one up, stick it in your ammo box, and keep it with you! Even the plastic bag it comes in can be zipped closed, so lint does not get on the Ripcord. How well does the RIPCORD work? The Ripcord works very well for a quick cleaning. If I were going on a trip someplace where I would have a chance to do some shooting (vs. a shooting vacation), I would add some Otis CLP, patches, and a bore brush. All of this fits inside the Ripcord bag, so I would be able to clean my handgun after shooting. I did this very thing for a weeklong visit to the NRA Whittington Center in New Mexico. We did lots of sightseeing, but only some shooting. Since it is “all guns, all the time” at our ranch, between teaching, competing, and writing about guns – mostly handguns – I could be classed as a professional shooter. So, I tried the Otis Professional Pistol Cleaning Kit, using it to clean .38, 9mm, and .45 pistols ( I have never owned a .40 S&W pistol). The kit includes two brass brushes – one for .38 and 9mm, one for .40 and .45; their Otis CLP; three cable pull throughs of 8 inch (with an attached patch loop), 12 inch, and 21 inch; a set of picks; a push-through weight; a fitting to create a “T” handle on the cables, which also can be a handle for the picks and screwdriver tip; a separate patch loop; a straight brush; plus patches, an empty chamber indicator that doubles as a bore light, and instructions. There isn’t a cleaning chore this set could not handle. Unfortunately, their attempt to make one size fit all extends to the instructions as well as the patches. The instructions do not explain why only the short cable has an attached permanent patch loop, and they did not include a device to let the cables be linked into a single long cable – a curious omission, considering all they do include. Nor do they cover all the included tools, although I was able to figure them out. All the tools are brass, except one extra tool, threaded on one end, that looks like a pin punch and is parkerized. 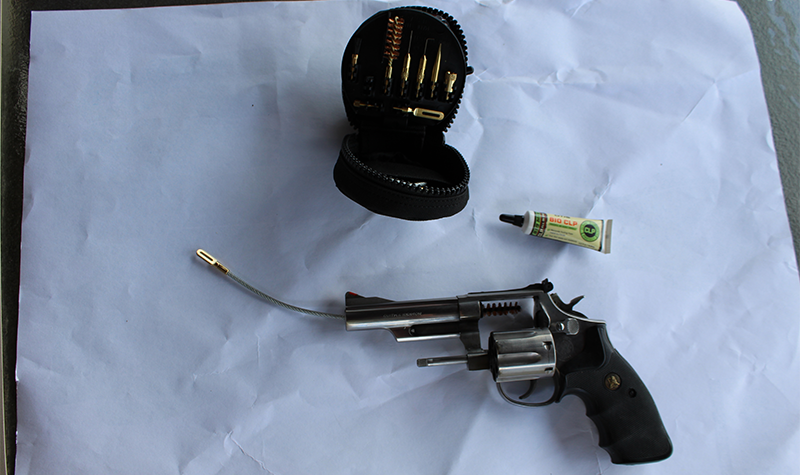 But the generalized instructions are not very helpful if you are brand new to gun cleaning. 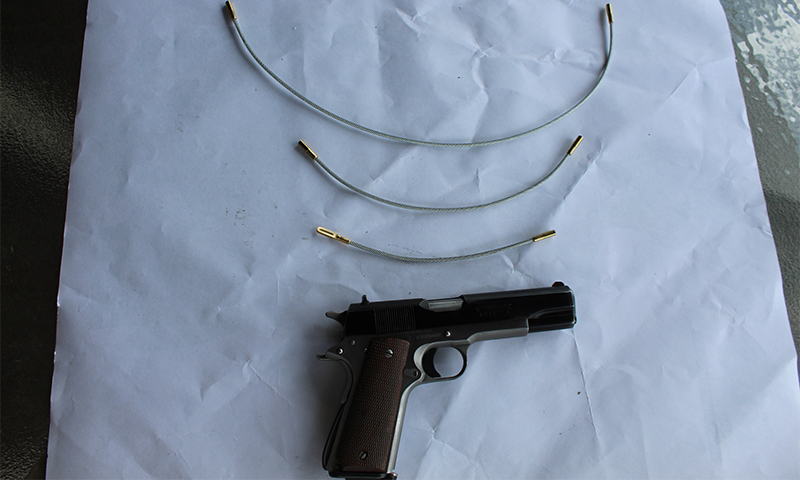 As I noted in my other article about the rifle cable system, sit down and watch the videos at Otis.com first, before using the kit. They really clarify the instructions. Otis CLP – can it really do it all? I may have to change my opinion on CLP – the Otis CLP certainly does a good job of cleaning the bores. The shortest of the cables works just fine on my carry and competition guns, and the system works perfectly even between stages of a USPSA match. With the blowing dust on most ranges, a quick cleaning can be important even at a smaller match, let alone a big competition. Just uncoil the cable, add a patch with some CLP, and pull it through. Add the brush (if necessary) for the 2nd pull, and use a dry patch to clean the bore. This is about the time it takes to run two shooters through a 20 round stage. A few drops of CLP on the slide rails and barrel hood, and you can MAKE READY with a clean, freshly lubed gun. Since I carry JHP ammo in my every day gun(s), but practice with lead or coated lead bullets, now I train and practice with the less expensive ammo, but clean the gun at the range before I get on with the rest of my day running errands. I’ll have to gain more experience with Otis CLP as a lube before I change my ways completely – yup, stuck in a rut a bit. 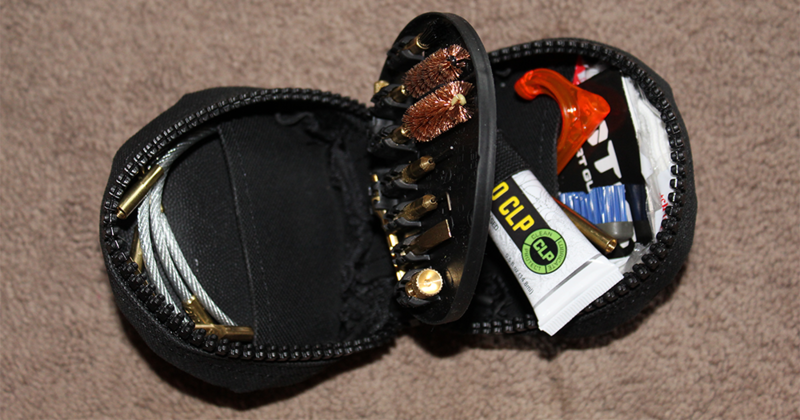 The cables work well, the brushes and other bits all fit and work well, and the pouch, designed to fit on a belt, will be found in my pack or cargo pocket when I venture out in the woods or on the range with a handgun. In fact, the kit has already found a permanent home in my “shoot’n stuff” bag! Both the Ripcord and the Professional Pistol Kit have a place with my gear. Now, I leave the range with clean guns, so when I get home I can focus on the rest of my life, rather than having to make time to clean the guns. 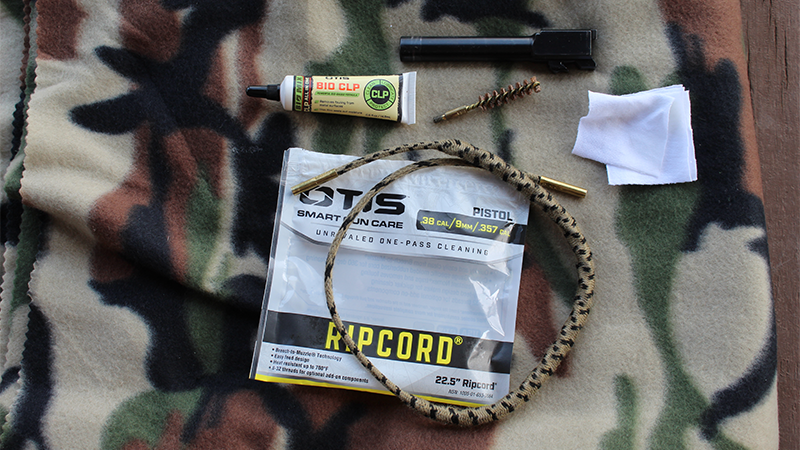 Otis has a well deserved reputation for quality, and both the Ripcord and the Professional Pistol Cleaning Kit enhance that reputation.